Does Feeding Dogs Fish Stop Them From Shedding? Limit excess dog hair by supplementing fish oil. The fatty acids that fish provide boost skin and coat health, but they aren't a cure-all in the face of excess shedding. Shedding is affected by environmental and nutritional factors. If you're looking for ways to reduce your dog's shedding, fish can help. Dry winter weather can affect a dog's coat, which is one cause of shedding. A natural shedding takes place once or twice a year for dogs with double coats -- the undercoat "blows" seasonally, usually spring and fall. The fatty acids found in fish, particularly omega-3 and omega-6, do reduce shedding but will not make it stop altogether. While fish oil can promote healthy undercoat growth, it does not reduce undercoat blowing. Choose either cooked fish, fresh fish or fish oil capsules. Sardines, pink salmon and mackerel are among dog-safe fresh fish varieties. Offer a dog of 20 pounds or less one sardine, which contains approximately 25 calories, from sardines packed in water -- not oil. Or offer Fido 100 milligrams to 150 milligrams of fish oil per 10 pounds of body weight each day. The more healthy Fido's food is, the more healthy he'll be overall -- skin and coat included. A dog food that contains vitamins A, B, C and E will boost coat health and reduce shedding. If your brand of dog food does not offer an array of vitamins, speak with your veterinarian about incorporating supplements into Fido's diet. Other foods to incorporate include sunflower and flaxseed oils, so try giving 1 tsp. per day as a fish oil alternative. 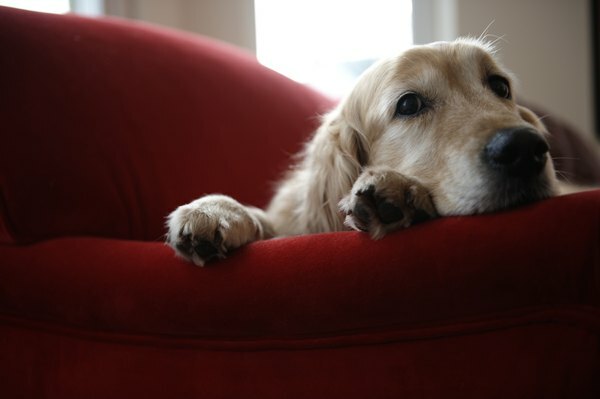 An underlying medical condition can cause excess shedding in dogs. These include stress, immune disorders, hormonal imbalances, fungal infections, parasites and a poor diet. Speak with your vet if Fido's shedding concerns you and you're reasonably certain it isn't a seasonal coat change. Your vet can perform tests to make certain nothing improper is occurring and discuss treatment options including fish oils. Chico Animal Hospital: What Can I Add to My Dog’s Diet??? Does Brushing Your Cat Help With Shedding? What Kind of Fabric Repels Dog Hair the Best? In What Months Do Dogs Shed the Most? How Many Fish Can Be in a 20-Gallon Fish Tank?